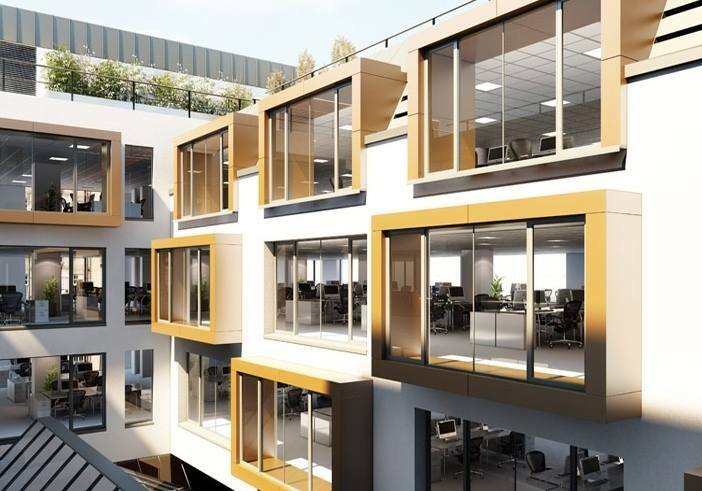 The refurbishment and extension of 65,000 sq ft of office space was always going to be an interesting project and we were extremely excited to be awarded the design element of the projecting bay curtain wall windows in the atrium, the roof top extension of curtain wall glazing as well as the aluminium rainscreen cladding element to the same areas of the job. The bay windows were the first area of works we tackled and though challenging it was enjoyable throughout. In all there were 39 such windows into the atrium area and 4 types all projecting by differing degrees meaning no straight forward detailing at all. The bay windows were constructed from Schuco curtain wall profiles and were supported either by the concrete structure (when not projecting) or a steel work portal frame when there was a projection. In the most extreme case this projection of a 2.5m x 4.5m was around .5m - 1m which resulted in a fair amount of engineering needing to be considered. On the roof top extension there was a mixture of curtain wall glazing and aluminium rainscreen cladding both of which interfaced with each other and both of which were pitched too creating some interesting geometry and fabrication drawings. Both the architectural curtain wall glazing and the rainscreen system were fixed back to a concrete structure at the cill and a steel work structure at the head. The rainscreen was then hung from a aluminium carrier rail system which in turn was secured back to a lightweight strutural frame system. Whilst this project was a challenge it proved to be a very fulfilling one and with Coca-Cola in talks to move into the new office space once completed in early 2014 we would like to think it was a successful one too. Schuco FW50+ SG & NCM bonded curtain wall / Schuco AWS 65 & ADS 65 windows & doors / Bespoke design aluminium rainscreen cladding.